Ankle Sprains are usually treated as a minor aggravation rather than an injury. The truth is, if you've sprained your ankle, it's very likely that you've damaged the soft tissue. This is an injury. We know you want to feel better as quickly as possible. We know you want to get back to your regular activities. If you want to recover from your Ankle Sprain in a reduced amount of time, you need the right treatment. You need soothing cold and comfortable heat. You need the KB Basics Ankle Wraps. 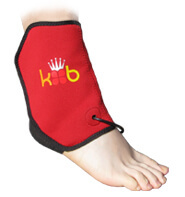 Wear a KB Basics Cold Wrap as much as possible to provide your ankle with cold and protect it from further damage. Use your KB Basics Heat Wrap first thing every morning. Use it 2-3 more times throughout the day. This will provide your ankle with soothing warmth. Avoid re-straining your ankle as much as possible. Using KB Support Tape will help with this. Giving your ankle a rest is hard, but it is very important in the early stages of healing. This is the therapy you need to recover quickly and completely. 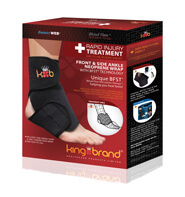 The KB Basics Ankle Heat Wrap is perfect for sore, aching Ankle Sprains. It's designed to conform to the shape of your ankle for complete coverage of the injury. Since the wrap is made of soft, light material, it's always comfortable to use. It slips on and off easily with no adjustment required. The Heat Wrap feels extremely warm and relaxing during use. Your sore, aching muscles, tendons and ligaments will appreciate the warmth. This is much more effective than a regular square or rectangular shaped heating pad, because it's custom designed for an Ankle Sprain. This means it's going to get in all the areas that a regular heating pad won't. It also stays on throughout use. The Heating Wrap is very easy to use. Pull it up onto your ankle, connect the power, and turn the controller to your desired setting. There are 3 levels to choose from - Level 1 (Minimum), Level 2 (Medium) and Level 3 (Maximum). The higher the setting, the more warmth you will feel. The controller has a built-in timer and will automatically shut the wrap off after 20 minutes. The Heat Wrap is both cost-effective and well-designed, with safety features that other traditional Heat Wraps don't have. If you have any questions about our products, please contact us and speak to one of our Advisors. Our knowledgeable Advisors have been thoroughly trained on our product lines. They are also knowledgeable when it comes to treating Ankle Sprains. They spend all day every day giving people treatment advice and guidance. It's what they do best. They also truly care about your recovery. If you need help picking the right product for you, please don't hesitate to contact us. We're here for you through every stage of your recovery. Cold and compression are exactly what your Ankle Sprain needs. 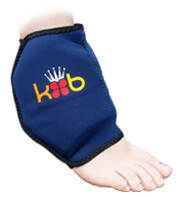 The KB Basics Cold Wrap delivers uniform cooling and maximum coverage of your sprained ankle. The wrap is made from thin, breathable material that prevents bunching and binding, so using the wrap is always hassle-free. It's made entirely of elasticized materials, so when you move, the wrap moves with you. Your sore, injured ankle will benefit greatly from the Cold Wrap. Since it's designed to mould around the front and side of the ankle, you're getting targeted cooling right where you need it. Since the RigiGel® pack is sewn inside the wrap, the gel always stays in place. Charging the wrap is easy. 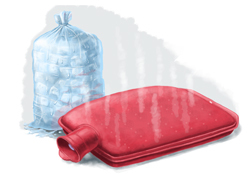 Simply place it inside the reusable bag and put it in the freezer for at least 3 hours prior to use. The Ankle Wrap contains 1 sewn-in RigiGel® pack. RigiGel® is a special gel formula that is firm yet flexible. This means it doesn't migrate to other areas of the pack like gooey blue gel does. RigiGel® will give a bit for comfort, but it won't move away from the injury, even when heavy pressure is applied. This means complete, effective coverage at all times. When you're not using your KB Basics Heat Wrap or Cold Wrap, your already damaged tissue becomes vulnerable to further injury. You don't want to re-injure your fragile, healing tissue and make your Ankle Sprain worse than it already is. Apply KB Support Tape over your ankle. This will provide your injured tissue with ongoing support and protection. If you're going to do something that involves heavy use of your ankle, apply an extra layer of Tape for bonus support. The Continuous Rolls of KB Support Tape are perfect if you're looking for a more customizable tape. 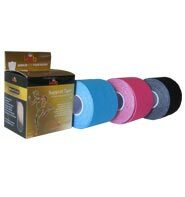 You can cut the Tape into a variety of different shapes and sizes to achieve a completely unique application for your Ankle Sprain. Each box contains 1 Continuous Roll of KB Support Tape that is 2 inches wide and 16 feet long. While we found the above application effective for Ankle Sprains, it's only an example. We encourage you to try different applications for your sprained ankle to find the one that works best for you. Also, remember to trust the pain. If you feel pain in a specific area of your ankle, apply the tape there. What sets KB Support Tape apart from the rest? It's not athletic tape, it's medical tape. This means our Tape is manufactured to ISO 10993 standards, which ensures that our Tape is made from extremely safe, biocompatible materials. Our Tape is made from materials that are safer than most baby products, including toys, clothes and even diapers. Don't let the big brand tapes fool you. Most of them are made from toxic materials, because there are no standards for athletic tape. Some big brand tape glues even contain carcinogenic ingredients. At King Brand®, your health and safety are of utmost importance, which is why KB Support Tape is manufactured to such high standards. When you entered our site, an Ankle Cold Wrap, an Ankle Heat Wrap and a roll of KB Support Tape were automatically put into your shopping cart. What's in your cart now is what you need to soothe your Sprained Ankle and prevent further damage. You may go to the checkout at any time or please continue to learn more about Ankle Sprains by exploring our site. You can also find products to treat other injuries and ailments in our shop. If you have an Ankle Sprain that just won't seem to heal, or that's especially severe, we have medical devices that can help. Our ColdCure® and BFST® Ankle Wraps will work to relieve your pain and heal even the toughest of Ankle Sprains. The ColdCure® Ankle Wrap does an amazing job of relieving the stubborn pain and swelling that comes with serious Ankle Sprains. ColdCure® gel packs contain 10x more gel per lb than other products. This means maximum coverage of your injured ankle. When stored in the freezer, they have 3x more cooling power per lb than other products for faster, more effective relief of pain and swelling. The ColdCure® Ankle Wrap comes with 3 XC Gel® packs, making it easy to swap them in and out of the freezer to keep your treatments going. Our XC Gel® formula is even more effective than RigiGel®. XC Gel® moves the cold energy within the pack where it's needed, eliminating the potential for hot spots. With no hot spots to worry about, your painful, swollen ankle is getting the cooling power of the entire pack every time. The BFST® Ankle Wrap works to accelerate the healing process through blood flow stimulation. BFST® promotes additional blood flow to the injured area deep below the skin, creating an ideal environment for healing. When we've injured ourselves, blood flow in the area of injury is reduced. This is bad because blood flow is the most critical element for a rapid recovery. While physical activity promotes blood flow, this can lead to further injury. The BFST® Wrap allows you to rest your ankle and avoid re-injury while stimulating the extra blood flow you need to heal. Since the effects of each 20 minute BFST® treatment last for up to 4 hours, it's best to spread your treatments out throughout the day. BFST® treatments feel great. Most people notice a slight tingling sensation and warmth from the increase in blood flow. KB Basics Heat Wraps and Cold Wraps are consumer products, not medical devices. However, they are manufactured by a medical device company, which means they're still King Brand® quality. We manufacture the safest, most effective products we can. We insist on OEKO-TEX 100 grade material suitable for undergarments and baby clothing for all KB Basics products. These materials are much higher quality than most other consumer grade products. King Brand® ColdCure® and BFST® Wraps are FDA Registered medical devices. They have also passed the Health Canada, ISO 13485, ISO 10993 and IEC 60601-1 3rd Edition approval processes. These are not simple consumer goods. These devices are intended to prevent, treat and cure soft tissue injuries and chronic conditions. Part of being an FDA Registered company means that our products are made from high quality, biocompatible materials. The ISO 10993 standard ensures that our products are made from materials that are safer than most baby products, including diapers, toys and clothes. These devices are manufactured and tested to the highest safety standards in the industry. Note from KB WebMaster - The text below is primarily intended to assist with Google properly classifying this page content. To learn more about our products please visit our website.<br>Ankle sprains plague many people. There are different types of ankle sprains. These are inversion or outside ankle sprains, eversion or inside ankle sprains and high ankle sprains, also known as a twisted ankle. A bad ankle sprain causes ankle pain. There are many symptoms of ankle pain caused by ankle sprains. Treatment for an ankle sprain will cause your ankle pain to improve and your ankle sprain to heal. There's no doubt that to heal an ankle sprain quickly you need BFST treatments. ColdCure will help with ankle pain. You can cure ankle pain and an ankle sprain with BFST and ColdCure technology. Some ankle sprains require surgery. This heals the sprained ankle but the pain in your ankle after surgery can be severe. The best ankle sprain treatment is BFST. The best ankle pain treatment is ColdCure. These wraps are incredible. They feel comfortable. They work. So, if you want to heal your sprained ankle quickly, you need BFST. If you want to treat ankle pain you need ColdCure. 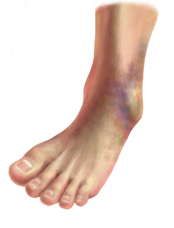 Ankle sprain symptoms are ankle pain and swelling, as well as bruising. A sore ankle can be helped with ankle exercises although ankle exercises won't cure all ankle injuries.